With a free morning airport shuttle transfer to Heathrow terminals between 06:00 and 10:30, Monday to Saturday mornings, Heathrow Lodge is just 10 minutes' drive from each terminal at Heathrow Airport. The shuttle can only be reserved at the time of check-in (subject to availability). The shuttle is not available after 10:30, or on Sundays. The 423 free public bus runs to and from Heathrow Terminal 5 until midnight. Bus 81 also runs past the Lodge from either Hounslow or Slough. Please note that bus 423 is free but bus 81 is not free. 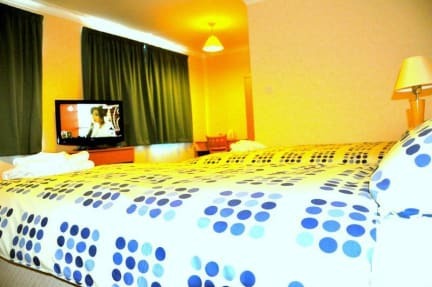 The en-suite rooms include tea/coffee making facilities and a flat-screen TV. Budget rooms are set in a building adjacent to the main building and include shared bathroom facilities. Budget rooms do not have TV or tea/ coffee-making facilities. WiFi is accessible only in the main building, at a surcharge. There are 2 local pubs/restaurants within 3 minutes' walking distance. 1. The nearest tube station is Heathrow Terminal 5. At Terminal 5, please go to Bus Stop No. 6 (outside Arrival), board the Free Bus 423 and get off at the first stop (stop name: The Square). Walk back 100 yards as bus drives past Lodge and Heathrow Lodge will be on the right hand side. 2. From Heathrow Terminal 1, 2 and 3: Please take the interchange train: Heathrow express (free of charge) from Heathrow terminal 123 to Heathrow Terminal 5 and then follow the guideline of Heathrow Terminal 5. 3. From Central Bus station: Please take the Bus U3 from central bus station and get off at stop Pinglestone Close. Then take 423 and get off in the stop: Heathrow Close. 4. From Heathrow Terminal 4: Please take the bus: 490 or 482 from stop no: 7 at Heathrow Terminal 4 then follow the guideline of Heathrow Terminal 5. Great place to have a hot shower and a warm bed for a night. Would definitely recommend. I’ve seen a lot of bad reviews but I had a great experience! For £40 you can get a private room with a bathroom the night before your flight. It’s old but clean. Rooms have a TV. There’s a free shuttle service to the airport in the morning, all you have to do is request it. Otherwise you can catch one of two bus lines. Great for flying, super close to airport, free airport shuttle, secure and clean but no free WIFI. Good location near a metro line. Rooms and bathrooms were clean. WiFi worked well. Not the quietest place, got woken up a couple mornings by the cleaning staff. The staff were fairly friendly. Rooms had steel doors and were secure. Good value for the money. Our room had no wifi which wasn’t ideal. Given the accomodation is close to Heathrow airport, most people require wifi after landing in the country. Smelled like cigarettes everywhere, impossible to get there at night, the bus I was told to take never came. Good for nothing other than 7 hours of sleep between flights. The Only good thing about this place is the location. As a solo female traveller, I did not feel safe.